All (or some, at least) will be revealed during a gameplay reveal livestream on May 1. 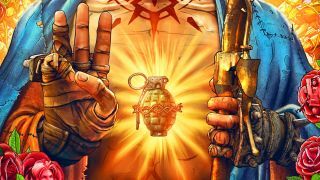 Some interesting hidden messages and Easter eggs have been found buried in the Borderlands 3 reveal art, but Gearbox says there are still some that haven't been found. To help internet investigators get on with the job, and remind everyone about the gameplay reveal stream coming on May 1, it's shared a high-resolution image of the image "as a hint" for internet investigators. The image is 4417x5528, so you can get a good, up-close look at everything, and contains the Morse code message discovered last week that hints at the return of the Destroyer—noteworthy because the code was absent from previous Borderlands 3 key art. And just like those messages asked rather than answered questions, Gearbox effectively stated that anything you manage to unearth from this image will probably keep you guessing until the gameplay reveal. "Despite some incredible internet sleuthing, countless questions raised by you, the amazing Borderlands community, remain unanswered. When will we learn more about the four new Vault Hunters? Who exactly are the Calypso Twins? Who’s the young girl bumping fists with Maya? And how the heck do guns grow legs?!" it wrote. "We’re excited to answer at least some of these questions and lots more during the Borderlands 3 Worldwide Gameplay Reveal event on May 1. The event will feature the first ever showing of Borderlands 3 gameplay, as well as commentary from the Gearbox development team on everything from the new Vault Hunters and their respective skills to interplanetary travel and sweet, sweet loot." The gameplay livestream will begin at 10am PT/1pm ET on May 1 on Twitch. Stay abreast of everything we know about the game here, and try your luck at decoding its secrets in the full-res image down below.